America is literally one of the biggest nations on the face of the planet when it comes to our waistlines. In fact, according to the Organisation for Economic Co-operation and Development (OECD) the U.S. ranks number one out of 29 countries worldwide in obesity rankings.1 The obesity rate in the United States stands at 34.9% of adults currently, 16.9% for our youth.2 We've definitely got work to do to improve this. Obesity comes with many challenges, not only in the form of our individual health, but also in terms of lost productivity and reduced economic output and stability as a nation. If we wish to lead a positive, productive life we need to get a handle on this obesity epidemic before it's too late. With that in mind, let's take a glance at how fat fits into our diets, and what we can do to make sure we get enough of this important nutrient without over doing it. Fat is one of three macronutrients that is essential for us to maintain a healthy mind and body. Our bodies need fat to thrive and survive. However, getting too much of this nutrient can lead to numerous health consequences you may already be familiar with. 1) The main function of fat is to act as a reserve storage of energy in our body. Carbohydrates are naturally our body's first and primary source of energy, but in times of famine or starvation fat is the next form of energy the body looks towards to fill the gap.3 We don't encounter famine-like conditions though in our modern-day world, not with grocery stores and convenience markets on every corner. So we don't need the excess baggage many of us carry around in the form of body fat, at least not to the extent that we do. 2) Fat acts as an insulating material to help us keep warm. It conserves body heat. Fats can be both good and bad for you depending on the type of fat and how much you consume. If you look at the chart above it's best to consume either monounsaturated or polyunsatured fats in the form of omega-3 fatty acids. Consuming trans fats, saturated fats, and polyunsaturated fats in the form of omega-6 fatty acids can be detrimental to your health, especially in excessive amounts. Low-fat diets have been shown in studies to be beneficial in achieving weight loss in obese adults.10 In addition, low-fat diets also lead to improvements in blood pressure, cholesterol levels, and fasting plasma glucose in these same studies after twelve months. Breast cancer risk was shown to be higher in women who had a higher intake of saturated and monounsaturated fats in their diets.11 However, a protective effect against breast cancer was seen in women who had a high intake of polyunsaturated fats in the form of omega-3 fatty acids. High intake of total fat, saturated fat, trans fat, monounsaturated, and polyunsaturated fat all increased the progression of age-related macular degeneration.14 In addition, animal fat intake was associated with a 2-fold increased risk of progression of disease while fats from nuts were shown to have a protective effect against macular degeneration. 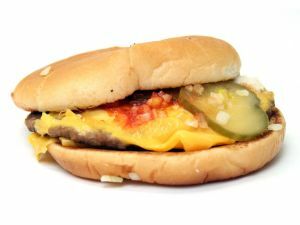 How Much Fat Do You Need on a Daily Basis? 1) Basic requirements to prevent a dietary fat intake deficiency is just 2-3% of your total daily calories as essential fatty acids (alpha-linolenic acid and linoleic acid).15 These two essential fatty acids are types of polyunsaturated fatty acids better known as omega-6 and omega-3 fatty acids. It is impossible not to get enough total fat in your diet if you're following a low-fat, whole foods, plant-based diet and ensuring adequate omega-3 fatty acid intake. Good omega-3 food sources in a plant-based diet include dark leafy greens, english walnuts, ground flaxseed, and chia seeds. Only 1-2 oz or tablespoonful of these nuts/seeds are needed to obtain your daily requirement of omega-3 fatty acids. 2) Eat a variety of whole, plant-based foods to reduce the amount of total and saturated fat intake in your diet. Animal-based foods have a higher total and saturated fat content and are harmful to human health. 3) The optimal ratio of omega-6 (O6) to omega-3 (O3) fatty acids should be 2:1 or less in your diet. The typical American diet has a ratio of O6:O3 to upwards of 25:1 or 30:1 which promotes chronic inflammation and disease. 4) Avoid all oils. Oils are 100% fat, and do NOT promote health. Olive oil is touted as a "heart healthy oil", but it is not. To understand why oils should be avoided read my articles below on this subject. 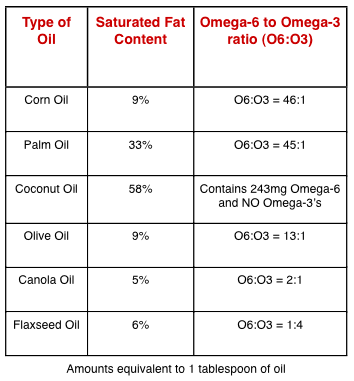 Refer to the chart below for the nutritional content of various oils. 1 Brunello G, Michaud PC, Sanz-de-Galdeano A. The Rise in Obesity Across the Atlantic: an Economic Perspective. OECD Health Data. 2005. 2 Ogden CL, Carroll MD, Kit BK, Flegal KM. Prevalence of childhood and adult obesity in the United States, 2011-2012. JAMA. 2014 Feb 26;311(8):806-14. 3 Galgani J, Ravussin E. Energy metabolism, fuel selection and body weight regulation. International journal of obesity (2005). 2008;32(Suppl 7):S109-S119. 4 Kremmyda LS, Tvrzicka E, Stankova B, Zak A. Fatty acids as biocompounds: their role in human metabolism, health and disease: a review. 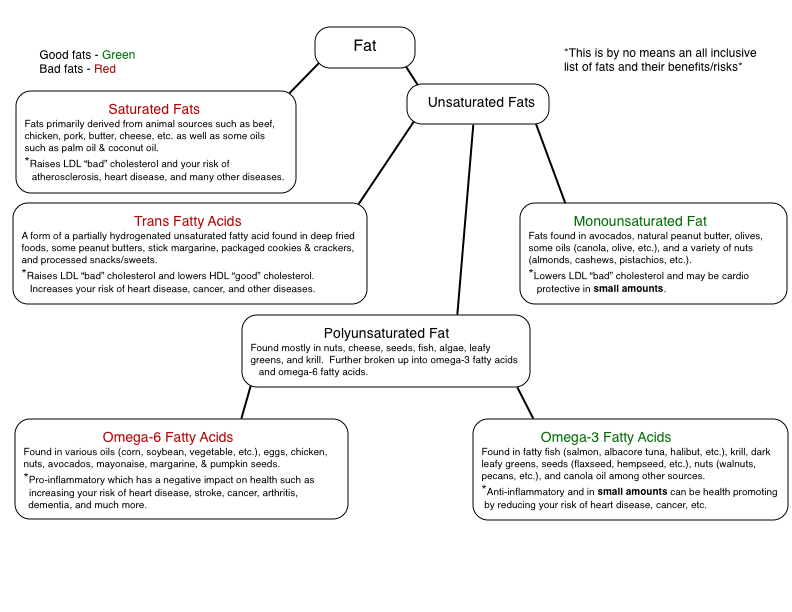 part 2: fatty acid physiological roles and applications in human health and disease. Biomed Pap Med Fac Univ Palacky Olomouc Czech Repub. 2011 Sep;155(3):195-218. 5 Spector AA, Yorek MA. Membrane lipid composition and cellular function. J Lipid Res. 1985 Sep;26(9):1015-35. Review. 6 Mozaffarian D, Micha R, Wallace S. Effects on coronary heart disease of increasing polyunsaturated fat in place of saturated fat: a systematic review and meta-analysis of randomized controlled trials. PLoS Med. 2010 Mar 23;7(3):e1000252. 7 Carayol M, Grosclaude P, Delpierre C. Prospective studies of dietary alpha-linolenic acid intake and prostate cancer risk: a meta-analysis. Cancer Causes Control. 2010 Mar;21(3):347-55. 8 Mozaffarian D, Clarke R. Quantitative effects on cardiovascular risk factors and coronary heart disease risk of replacing partially hydrogenated vegetable oils with other fats and oils. Eur J Clin Nutr. 2009 May;63 Suppl 2:S22-33. 9 Kuo PT, Whereat AF, Horwitz O. The effect of lipemia upon coronary and peripheral arterial circulation in patients with essential hyperlipemia. Am J Med. 1959 Jan;26(1):68-75. 10 Avenell A, Brown TJ, McGee MA, et al. What are the long-term benefits of weight reducing diets in adults? A systematic review of randomized controlled trials. J Hum Nutr Diet. 2004 Aug;17(4):317-35. 11 Saadatian-Elahi M, Norat T, Goudable J, Riboli E. Biomarkers of dietary fatty acid intake and the risk of breast cancer: a meta-analysis. Int J Cancer. 2004 Sep 10;111(4):584-91. 12 Kalmijn S. Fatty acid intake and the risk of dementia and cognitive decline: a review of clinical and epidemiological studies. J Nutr Health Aging. 2000;4(4):202-7. 13 Hu N, Yu J-T, Tan L, Wang Y-L, Sun L, Tan L. Nutrition and the Risk of Alzheimer’s Disease. BioMed Research International. 2013;2013:524820. 14 Seddon JM, Cote J, Rosner B. Progression of age-related macular degeneration: association with dietary fat, transunsaturated fat, nuts, and fish intake. Arch Ophthalmol. 2003 Dec;121(12):1728-37. 15 Davis BC, Kris-Etherton PM. Achieving optimal essential fatty acid status in vegetarians: current knowledge and practical implications. Am J Clin Nutr. 2003 Sep;78(3 Suppl):640S-646S. 16 Esselstyn CB Jr, Ellis SG, Medendorp SV, Crowe TD. A strategy to arrest and reverse coronary artery disease: a 5-year longitudinal study of a single physician's practice. J Fam Pract. 1995 Dec;41(6):560-8. 17 McDougall J, Thomas LE, McDougall C, et al. Effects of 7 days on an ad libitum low-fat vegan diet: the McDougall Program cohort. Nutrition Journal. 2014;13:99.